Just in case you've bought into the lie that Barack Obama plans to raise your taxes, it's time for a reality check. The Tax Policy Center has done an independent analysis on both Barack Obama's and John McCain's tax plans (actually months ago) and has declared that both men will cut taxes. This report is relatively obscure, detailed, confusing and boring. But, it is finally being digested by some main stream news agencies and everyone who has looked at the report and both plans (with the exception of the John McCain campaign) agrees that both men will cut taxes. So, why does John McCain continue to run ads saying that Barack Obama will increase your taxes? Why do so many people continue to believe it? Well, tell a lie enough times and with enough force and a certain number of people will believe it. Here's the truth. The Tax Policy Center has said in terms of revenue, both plans are relatively the same. The difference comes in who gets the majority of the cuts. McCain wants to cut taxes across the board. But, to pay for that, he gives relatively little relief to the little guy. The guy running the ads saying the other guy wants to raise your taxes, gives most of his relief to the wealthiest among us. Obama says not everybody needs a tax cut and to pay for the little guys' tax cuts, he's going to take a little more from the relatively well off (those making more than $250K a year, but I think they can afford the $12) and he'll take a chunk more from those making more than $603K a year). Obama's plan actually gives families making between $40,000 and 66,000 almost three times the amount of relief McCain would give to those families. Look at this chart and tell me would your taxes go up or down under Obama. Even Fox News has figured this out. Watch this two minute interview with Tucker Bounds, a top McCain advisor. Did you catch that? Their justification for continuing the claim that Obama will raise your taxes is not his tax policy. It's not what he's stated he will do and has laid out a plan for. It's not based on independent third party analysis. It's based on their interpretation of his voting record. So, if you believe that Obama is lying to you and playing a bait and switch, you can continue to believe he's going to raise your taxes. But, if you believe he's going to implement the tax plan he said he's going to, he is not going to raise your taxes. Now the kicker and a confession. Both plans. Let me repeat that. Both McCain's and Obama's plans increase the deficit. McCain says he'll make that up by stopping earmarks (let's hope he doesn't put Sarah Palin in charge of that little duty- sorry, couldn't resist). But, spending cuts are hard to do. Look at what Mr. Fiscal Conservative George Bush and the Repulican Congress (for six of his 8 years) did with spending. The question I have is can we really afford anybody's tax cuts right now? But, that's another story. The point of this story is, if you're a guy voting for your own pocketbook and to get the bigger tax cut, read the chart and if you planned to vote for McCain, you might want to rethink that. I'll tell you this much about how I vote. Based on this chart and this one issue alone, I'd be better off voting for John McCain. But, guess which way I'm going in November. My hope is that a rising tide raises all ships and that by Obama giving more money to more people and giving them the ability to afford my goods, I'll be privileged enough to pay even MORE taxes. Also, I think it's just the right thing to do. If we're going to give away money we don't have, let's give it to the needy, not the guy making more money in a year than most people have in their life savings. The confession, you ask? In the opening paragraph, I was careful not to say that Obama will not raise your taxes. The truth is I think both tax plans (based on the little I know about economics) are in trouble from the start. If they think they're going to fund tax cuts by reducing spending, they're dreaming. I would not be surprised to see drastic alterations to either McCain's or Obama's plans once they actually take office. But, based on what they've laid out they will do, Obama gives more of a break to the majority of the people I know than McCain does. So, does any of this surprise you? I am looking strictly at how they voted. I never believe the plans they put forth in their campaigns. George Bush senior told us to read his lips and then went along with congresses giant tax increase. Bill Clinton ran on giving the middle class a tax cut, but two weeks into office he said (Paraphrasing closely here) "I have worked harder these past two weeks than I ever worked on anything in my life...and I just can't find a way to lower middle class taxes". I voted for both of these men, but I was younger and less politically astute back then. Look at their voting records in the senate. What bills do they have their name on? That reminds me. Check out who wanted to fix Fannie Mae several years ago, but was stopped by the opposing party in congress from having the bill even voted on. It is now dead. I think that is very interesting. Yes, that is very interesting. I wonder which John McCain we'd get though. The one who is generally opposed to deregulation or the one who wants to regulate. And, I understand your voting on the record rather than on their plans. But, neither man has ever been President before or had the ability to set policy from that POV. So, I do give their plans some weight. Neither will implement them exactly as they are. I agree. But, it's clear to me that Obama tends to favor giving the majority of relief to the least wealthy and McCain supports what you could term either "trickle down" or across the board cuts, giving huge breaks to the super-rich. Yep, Bob. Spending cuts ain't likely to happen (unless we can stop going to so many wars). That's why I think both tax cut plans are unlikely to go through as planned. I really only wanted to point out that the McCain camp's insistence that Obama will raise your taxes is based on conjecture rather than on Obama's plan. 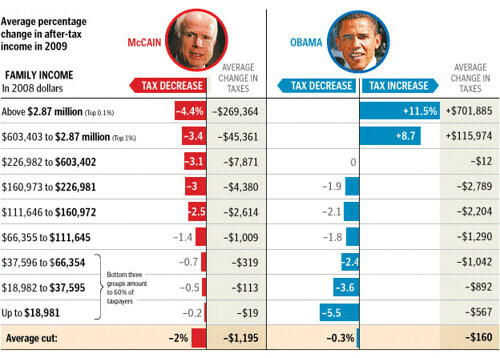 Independent analysis of both plans shows that Obama's plan reduces taxes for the middle class significantly more than McCain's does. Yep. Promising tax cuts is pandering. But, when is the last time a politician running for any office mayor or higher won without promising tax cuts? If I were to believe either of these men could get their plans through congress without drastic changes made to them, or if I were to believe they actually do plan the tax cuts they are proposing, I still favor Senator McCain's over the two plans. Higher taxes have never generated more income for the government for one thing. Secondly, it does not help me one bit if my boss has to shoulder a larger tax burden. That burden can only trickle down in many ways to me as an employee. When corporations and businesses need to find ways to cut expenses, they always look to manpower first. That's a hard cold economic fact. It is the easiest way to cut expenses. So when my boss is faced with a higher tax burden, he won't actually pay it. My benefits might be cut, or I might not get that bonus I anticipated, or my annual pay raise simply may not happen next time. Right now the financial industry is in a major slowdown. Banks are losing money on bad investments such as housing loans. Does anyone really think that by excising a larger tax burden on these institutions (for example) will help the economy? No. Those banks that survive will do so by becoming leaner. What do I mean by leaner? They will cut costs. What are the easiest costs to cut? Employees. In other words, bite the hand that feeds you and you might not eat. The next thing it will do is decrease the amount of risk they take in extending credit. They will go for the sure thing to make up for the heavier taxation. These are cold, hard economical facts. How exactly does it help YOU for your boss to pay more taxes? Please explain to me why I should support raising ANYBODY'S taxes at all? It is a proven fact that increasing taxes does not increase revenue unless you make a gigantic increase . I would cite the results of George Bush Senior's tax increases. What happened almost immediately after that? Recession. Remember Clinton's campaign slogan? "It's the economy stupid". Then Clinton ran on cutting taxes and ran ad after add of Bush saying "Read my lips....no new taxes!". Those tax increases did not ever bring in more revenue. It simply punished success. That resulted in a recession. As of right now, despite all of the talk for the last two years on the campaign trail, we are not in a recession. We may be in the near future, but right now we are not. If you want to make sure we have a recession, raise anyone's taxes. Instead, do unto others as you would have them do unto you. Lower my taxes, lower my brother's taxes too. Your argument seems to assume that anyone making more than $600,000 is a business owner and that rather than paying his taxes, he's going to fire employees. Let's assume for a moment, they are all business owners. Remember, taxes are taken AFTER profit. So, to say that he can't afford to pay the additional tax is a farce. People act as if "tax burdens" are a cost of doing business. Taxes are taken after write downs, after expenses, after the employees are paid. So, don't let corporations scare you by saying if they have to pay more taxes (higher rates) that they'll cut expenses. It's nonsense. Secondly, there are individuals up these tax brackets that could afford to pay more and give the guy making $40,000 trying to support a family a break. McCain's plan assumes that everybody needs to keep the break that Bush gave them. Obama's plan assumes that the ultra-rich can afford to give back the break to help out the little guy. And, if the little guys can afford to buy more goods, eventually that trickles UP to the big guys. As a business owner, who sells items mostly to women, mostly to African-American women, I want to see more money in their pockets so they can afford my goods. If my tax rate goes up, I'm not going to fire employees. It wouldn't do me any good anyway because it would lower my expenses and raise the amount of profit I'm making, for which I'd be taxed. They are two very different plans and it's good that people understand the differences. But, again the perception that Obama is going to raise taxes on the majority of people is the false information I wanted to combat. Now, we can discuss whether we prefer trickle down or trickle up. You are missing my point. I'm a Libertarian. I believe in Liberty first. I believe in a very tiny government. I believe in lower taxes for everybody. I do not believe in income redistribution. That is the foundation of socialism, something that is diametrically opposed to my worldview of liberty and freedom FROM government. Socialism needs a big brother government that is intrusive and excising. Liberty requires as little government as possible. You are absolutely correct in saying that the taxation is on the income after expenses. If I make a hundred dollars a day and pay 35 dollars in taxes, my income is effectively reduced to 65 dollars a day. I like bringing home 65 dollars a day. Now if suddenly I have a ten percent increase in my taxes, my effective income will now be 55 dollars a day. Somehow, I will have to find a way to get back to bringing home 65 dollars a day. How can I do this? By cutting out spending. In order to bring home that 65 dollars like I am used to, I will have increase my income to 110 dollars a day. In other words, I will have to cut my expenses and run more lean. My overall intake of capitol is not likely to go up, so now it looks like budget cuts. For the business world, the easiest budget cuts are personnel. This is a fact that you can not avoid. In other words, these wealthy folks will stop spending 10 percent in some way or another to boost their overall income by the same ten percent that the government is taking off of them. Many people work for employers that will see their taxes increased by Obama's plan. Those employers have stock holders that will demand a return on their investments. They can not afford to let their shareholders down, so they will do whatever it takes to make sure that effective income is not diminished, even if it means layoffs and pay cuts. Can you give us an example of a country that has such a government Someday? Libertarian? Fascinating concept. Has it ever worked? I'm not sure why socialism is such a dirty word. Personally, I have no problems with socialism. But, I'm afraid that you're wrong when you call a progressive tax system socialism. AFAIK, the income tax system in the United States has always been progressive. And, what is being called "tax increases" under Obama's plan is really a roll back to the rates we had long ago before all the tax cuts for the megawealthy, who BTW, are the only ones who enjoy their large loopholes and end up paying for less than these percentages anyway. They deduct and deduct until their reportable income goes very low. I'm sorry. But, your assessment on how business, taxes and profit works just don't work for me. Taxes are paid after all expenses. So, cutting personnel would not be necessary or beneficial if tax rates go back to where they were. Either a business needs the employees or it doesn't. Any business that can make the same production levels with less employees is already letting its shareholders down. It makes no sense to hold onto employees just so you can pay them a salary. And, it makes no sense to cut necessary employees to cover your tax bill. I'm sorry if this is offensive. But, IMO, libertarianism is a very cowboy like me-first mentality. And, AFAIK it has never worked in the real world anyway. As an ideal, I prefer socialism which is a share the wealth model. Problem is, it doesn't work either. Capitalism proves to be the best model for getting things done. Mix that with a little socialism to protect the weak and you've got a pretty good working system (kind of like the United States has). In answer to the question of a nation that has such a government, I would point you in the direction of the USA before Woodrow Wilson. Wilson invented the Income tax, rewriting the constitution to do it.He also pushed passage of the Sedition Act of 1918, which imposed heavy penalties on anyone convicted of criticizing the Constitution, the government, the military, or the flag. Roosevelt invented the "fairness Doctrine" that ended criticism of his social policies. Can you name any shining success stories of social programs the government has implemented.....ever? Always it seems we are told we need more funding and all will be well with them. But they never improve. What have we done with all of these billions of dollars that has been spent to improve the lives of our underclasses? Look at our inner cities. Exactly the opposite of what was intended with all of these social programs is happening. They are a miserable failure. And I am to believe that more socialism will fix what socialism has broken to begin with? If you want an example of a modern nation built on liberty, I would point you towards the former USSR occupied nation of Estonia. They know how socialism failed, and they have created perhaps the freest nation on earth. They keep cutting taxes and reducing spending. And their people are very free and their GDP per capita is skyrocketing. The government gets smaller and the people get more liberty in return. I disagree that Libertarianism is based on greed. That is the same sort of thinking that causes men like Seantor Biden to announce that paying higher taxes is somehow patriotic. King George probably told that to the men who were dumping tea in the Boston Harbor too. Liberty is about individual responsibility. It's about not asking some one else to solve the problems that face you and society. It's about being a good citizen and respecting the liberty of your neighbor. It's about helping out your neighbor, like we used to do in this country. Now we tell them to turn to the government for help. That's true greed....expecting the government to do for the less fortunate what we ought to be doing. It's easy to feel good about ourselves by saying that we believe in social justice when we are condoning taking money from someone else to help the less fortunate. We pat ourselves on the back and congratulate ourselves because we care. That is nothing to congratulate ourselves for. That is expecting someone else to do what we ourselves do not want to do. Meanwhile, while someone else is expected to be "patriotic" and give more to king George, we don't want to be more patriotic in that sense. Let the other be patriotic. Let the other pay their share, we want our own taxes cut. Let the other take care of the poor, by the force of governmental police power. This is class warfare, nothing more. There was a guy in the US presidential seat who wanted to balance capitalism with socialism in the early 21st century. He called it "compassionate Conservatism". The same sort of administration we should be moving away from. Towards more socialism isn't the answer. It hasn't worked anywhere at anytime in history. I am not against all social programs. There is a need for the poorest of the poor, for those who absolutely can't make it otherwise.Unemployment compensation is a good thing, but we should be prepared for this possibility by saving for a rainy day like our grandparents used to do. But if you are an able bodied person with an acceptable IQ, don't expect me to feel good about my tax dollars going in your pocket. The same goes to failing corporations that expect me to pay for their poor business practices. Along with that, I won't force them into bad business dealings through political pressure either. That is ultimately why these banks are failing. Political pressure was put in place to hand out home loans to people who really could not afford it. Fannie Mae And Freddie Mac had to buy these bad loans. It was politically motivated by the socialist minded people in Washington that created this mess to begin with. When private financial institutions are virtually forced to make loans to people with a bad credit and job history .. this is what you get. Fascinating, Someday. I missed it though. Are you voting for McCain or Bob Barr or John McCain? McCain wouldn't seem to fit your bill of "Libertarian". BTW, no political or economic system is perfect. Socialism (pure socialiam) fails because people are basically greedy and will not work hard without seeing personal gain. Capitalism (pure capitalism) is evil because it leaves the weak to fend for themselves and a truly "natural" order is not humane. What we truly need is changed hearts and minds. Ideally, we could do away with all government. But, in the meantime we have to muddle along the best we can. America does pretty well. We can always perfect it more. Incidentally, I don't think it's totally fair to blame the Bush administration for this crisis either. Have a read. Don't listen to the rhetoric. Interesting, Someday. But, here's the deal. When you're the boss, the buck stops at your desk. Period. I own my own company. If an employee messes up, the customer doesn't care, it's my company that messed up. The Republicans have been in charge of the Congress for six of the last 8 years and the White House for 8 of the last 8 years. The buck stops with them. Every administration wants to take credit for the good that happens under their watch and deflect the bad. That's OK. That's human nature. But, the reality is you have to take responsibility for what happens under your watch. Period. But, let's say you want to absolve the Bush administration of responsibility. Who gets the blame? I'm actually voting for Sarah Palin. Bob Barr has no chance to win. I know that it seems odd to vote for the bottom side of the ticket, but I know that she will be the future if she gets her foot in the door. I think Senator Clinton will be the first female president if McCain/Palin wins unless McCain only runs for one term. Then who knows. If Obama wins, I would not be completely surprised if Sarah Palin becomes the first female president. I originally was not going to vote at all, I liked McCain better than Obama, but not enough to actually get me excited to vote. If his plan when he picked her was to get folks like me to get out and vote, it worked. There you go. McCain gets your vote with Sarah Palin. Let's just hope his health holds up for four years. I don't think you'll see Sarah Palin as President unless McCain becomes incapacitated in office. I think people are enamored with the idea of Sarah Palin. But, I don't think too many people really want Sarah Palin calling the shots. But, I've been wrong before. I'm not absolving the Bush administration, nor the Clinton Administration, nor the Senior Bush Administration. They are all guilty of helping create this mess. Both parties are equally guilty in my eyes. Yes, it was a republican congress that was in charge when this reform legislation was introduced, and it was killed by them. I am saying it is essentially caused by our nations socialist policies that created this particular mess. Compassionate conservatives are the same thing as a socialist democrat. Two sides of the same coin. You must understand, the Democrats, under Clinton, strengthened a government-created monster called the "Community Reinvestment Act." This law was then used by activists to coerce lending institutions to make these bad loans ... millions of them. The Republican congress at the time approved Clinton's plan here. It has had unintended consequences. The truth is that nobody who saw it coming did a thing to stop it. In fact, most of them had a hand in creating this monster. It would go a long way towards fixing a lot of our problems if we could all just say, "yup, we screwed up." Recognize it, stop using it for political gain and work to undo the policies that created this mess to begin with. I mean honestly, one of the candidates is very closely tied to Fannie Mae and Freddy Mac through campaign contributions and their executives, and the other one has at times spoke of deregulating the industry. The result is we, the taxpayers are now the proud owner of failing banks. What are we going to do about it? Is this the "link" you're speaking of between Obama and Fannie Mae/Freddie Mac? Hardly an "advisor" by any stretch of the imagination. I agree that these peripheral relationships need to stop being used for political gain. But, the fact is we are faced with a decision between two parties coming up in a few weeks. And, the economy is going to be a big factor in the election. One of the things we typically do is look at how the party in power for the most recent term(s) has done. For better or worse, John McCain is running as a Republican. On some issues he seems to be becoming more Republican (stem cell research, off-shore drilling, stronger on Pro-life, seeking support of evangelical pastors), while on others, he's becoming less Republican (now he's Mr. Regulation and even wants for form a new regulatory agency). If he's going to run as a Republican, he can't run away from the Republicans at the same time- at least that doesn't work for a lot of us. Or is the Post correct this time? Essentially, are they saying to believe them.....now....or then when it wasn't political suicide to be associated with Raines? Is this a pattern, these associations that are not associations? Was Raines lying to the Washington Post in April when he told reporter Anita Huslin that he had, "taken calls from Barack Obama's presidential campaign seeking his advice on mortgage and housing policy matters" or is he and Senator Obama lying now? I am not personally willing to explain this matter away so easily and call McCain a liar....as has been done. He quoted a reliable source. That is, unless it is totally unreliable, in which case, I can't rely on the report that there is no connection either. It's all double speak from the same newspaper. Someone is lying, but it is not McCain. Even if the Post article is accurate, it's a weak link at best. He's not an advisor to Obama. Maybe someone on Obama's staff called and asked him a question. Maybe not. McCain knew it was a weak link at best and the ad makes the link appear much, much stronger than it actually is. There's lying and then there's deceiving. Technically, maybe the ad isn't a lie. It'll be interesting to see what Factcheck.org has to say about this one. I'm waiting with bated breath.